Traylor Elizabeth Howard (born June 14, 1966) is an American actress. She is known for playing Sharon Carter on the television series Two Guys and a Girl, and Natalie Teeger on the USA Network series Monk. Howard was born in Orlando, Florida, to Peggy E. (née Traylor) and Robert M. Howard, Jr., president of the Howard Fertilizer and Chemical Company. She attended Lake Highland Preparatory School in Orlando, Florida. In 1994 Howard appeared in one of the "You Will" series of television commercials for AT&T Corporation. Howard's most prominent roles to date include Natalie Teeger, Adrian Monk's (Tony Shalhoub) assistant on the USA Network television series Monk, and Sharon Carter, the "girl" of the title of the 1998–2001 sitcom Two Guys, a Girl, and a Pizza Place (later retitled Two Guys and a Girl). She also starred in the short-lived sitcoms Boston Common and Bram & Alice alongside actor Alfred Molina. In 1999 she appeared in the Foo Fighters' music video "Breakout". During the third season of The West Wing, Howard made a guest appearance. She was the romantic lead in the Norm Macdonald film Dirty Work. Howard has been married three times. Her first marriage was to actor Cameron Hall on February 2, 1991, which ended in divorce on March 12, 1993; the couple had no children. Her second marriage was to actor Christian Navarro on April 26, 2003, which ended in divorce in 2006. They also had no children. On November 24, 2006, Howard gave birth to a son, Sabu. She was pregnant with him during season five of Monk, so she spent several episodes with boxes, newspapers, and the like in front of her abdomen to hide the pregnancy. Traylor married for the third time in 2011 to Jarel Portman, son of famed architect John C. Portman Jr.; the couple's son Julien was born in 2012. 1994 Lois & Clark: The New Adventures of Superman Dr. Heller's Office Temp Episode: "Madame Ex"
2002 The West Wing Lisa Sherborne Episode: "100,000 Airplanes"
2002 First Monday Ashley Riverton Episode: "Right to Die"
2002 The Division Sarah Franzen Episode: "Remembrance"
^ Lee, Luaine (10 November 2009). "'Monk' role has been a dream job for Traylor Howard". PopMatters. Retrieved 23 May 2016. ^ "Biography for Traylor Howard". IMDb.com. Retrieved June 14, 2015. ^ Green, Josh (May 18, 2014). "Building on his father's legacy" (PDF). The Atlanta Journal-Constitution. p. 2. Retrieved February 1, 2016. ^ "Shows A-Z - Nolan Knows Best on ABC", TheFutonCritic.com; accessed February 1, 2016. 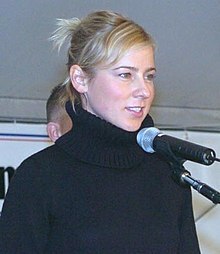 Wikimedia Commons has media related to Traylor Howard. This page was last edited on 2 October 2018, at 23:51 (UTC).